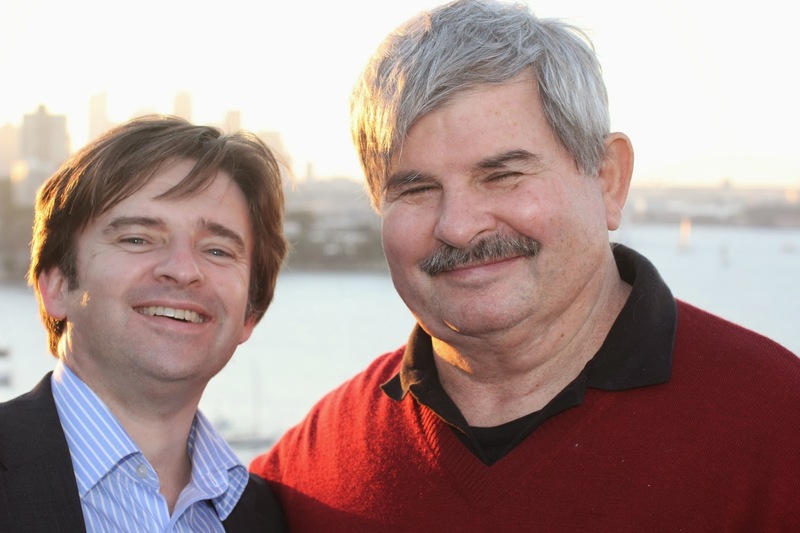 I am delighted to have joined the newly formed advisory board of QFire Software, alongside Bill Inmon, President of Forest Rim Technologies LLC and "father of data warehousing". As an advisory board member, I will provide QFire with domain and corporate advice in the areas of Data Governance and Data Quality including input to product review, corporate strategy and approach to market, as well playing a role in customer advocacy and community engagement. QFire is emerging from the Australian startup market and is potentially a game changer in the area of Data Governance and Information management. The company provides solutions for distributed data quality management and is focused on making their product very easy to use for end-users, while it is also very easy to embed within other applications - for me, that makes them unique. QFire’s exciting, innovative approach means that companies do not have to enter into a major project implementation to drive a culture of data quality in a business. It deploys easily and cost effectively, allowing companies to see rapid results and to drive the cultural change necessary to support the financial benefits of improved data governance. Founded in 2012, QFire Software delivers organisations the ability to understand, collect, validate, protect, monitor and enrich their data aimed at lowering the complexity of governing data quality rules, and empowering responsibility within business users. QFire is a versatile data solution for both government and industry, delivering data quality at the desktop. Designed by business users for business users it ensures that data inaccuracies are identified and rectified before they become part of critical decision processes. QFire is now represented in Australia, New Zealand, India, South Africa, Europe and the US. 5th Annual Records & Information Officers' Forum, 19-20 Feb. I am delighted to be chairing the forthcoming Records and Information Officers' Forum, to be held at the Rendezvous Grand Hotel, Melbourne on 19th & 20th February. What data should be stored, and how long should we keep it. 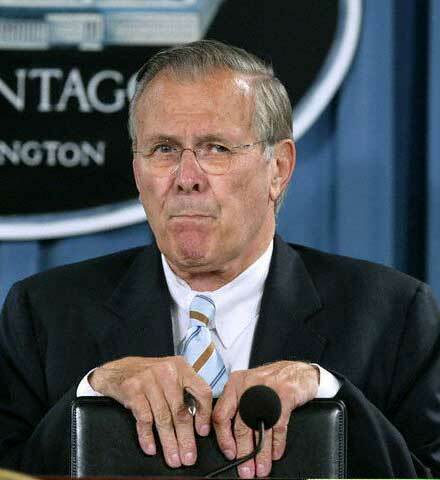 Donald Rumsfeld – My Hero! “…. there are known knowns; there are things we know that we know. Rumsfeld was broadly ridiculed, then and since, including earning the 2003 Foot In Mouth award. However, I have to declare that I am a fan (not of the man himself, I personally think his politics were pretty much despicable! ), if only because this seemingly tortured use of language inspired me to develop the “Donald Rumsfeld Magic Quadrant”, which I have been using successfully as a diagnostic model for a number of years now within business transformation and change situations. The X-axis illustrates a measure for a person’s overall consciousness of a given subject – how aware are they of the issues at a level of theoretical understanding. The Y-axis captures a measure of a person’s level of competence in executing the capability or skill at a practical delivery level. 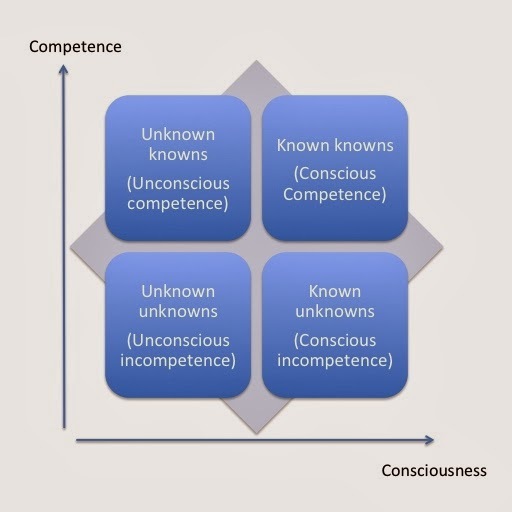 This Magic Quadrant style matrix now allows us to assess the current-state situation for any given organisational endeavour, simply by mapping the levels of consciousness and competence against the quadrant diagram. This simple evaluation matrix can be applied to any area of skill, capability or endeavour e.g. Are the business team aware that there are data quality issues preventing us from marketing to some of our key customers, and what the underlying root causes are? Do they actually have the skills necessary to fix the data and ensue that it stays fixed? If you’re in the mood to make your assessment a bit more sophisticated and want to evaluate the degree of consciousness & competence, then you could choose to grade on a Likert Scale e.g. 1=Blissfully Ignorant; 2=Largely Oblivious; 3=Somewhat Concerned; 4=Matter of Urgency; 5=Aaaargh!!!! 1=Doh! ; 2=Yes, I'll Get Onto...Oh Look A Squirrel; 3=Leave It With Me; 4=I've Got This; 5=It's Already Dealt With, What's Next? Typically, when any new capability is to be introduced within the organisation, people will initially be in a state of blissful ignorance, unaware that an issue might even exist, let alone have the skills to address the problem. 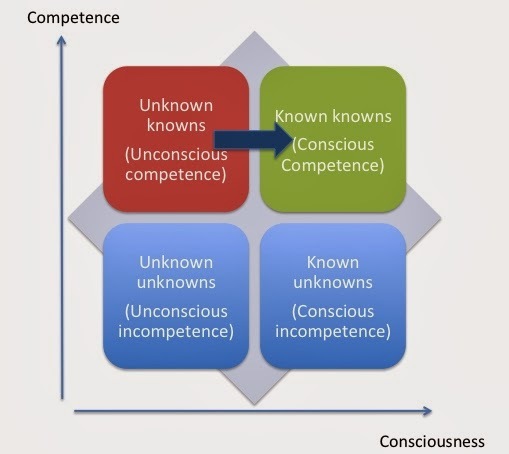 This baseline starting point is mapped in the red quadrant of “Unknown Unknowns”. 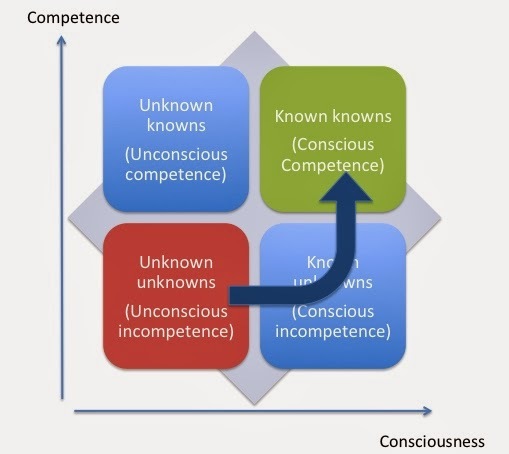 We aspire to achieve the “Known / Knowns” status of the consciously competent expert practitioner, where the issues are well understood and with the skills and resources available to ensure that they are properly addressed. Now, a standard learning and teaching path will lead us out from the red zone, and towards a developing a level of the “known unknowns”. Once there is understanding of the requirements, then delivery and capability uplift can occur to develop the organisational skills and competencies necessary to deliver value. A a more problematic learning path occurs when people exist within the organisation who already have some level of proficiency in the capability, but without fully understanding the processes and mechanisms that they are executing (we might call them “happy amateurs”). They’re getting by, but their efforts are typically not efficient, and may not be all that effective. This is where we need to work really hard to identify those “what’s in it for me” factors that will encourage further learning and improvement. Whichever learning scenario you encounter, mapping your customers against the “Donald Rumsfeld Magic Quadrant” will help you understand the dynamics that are at play, so that you can then target your education and change efforts accordingly. In his excellent blog on the MIKE2.0 site, Jim Harris recently drew an analogy between the interactions of atomic particles, sub-atomic forces and the working of successful collaborative teams, and coined the term ego-repulsive force. Jim’s post put me in mind of another aspect of physics that I think has parallels with our business world – the Second Law ofThermodynamics, and the concept of entropy. In thermodynamics, “entropy” describes a measure of the number of ways a closed system can be arranged; such systems spontaneously evolve towards a state of equilibrium, which are at maximum entropy (and therefore, maximum disorder). I observe that this mechanism also holds true for the workings of organisations – and there is a law of Business Entropy at work. The role of management, then, is to introduce additional energy into the closed system of the Brownian organisation, whether through raw enthusiasm, new ideas, encouragement, or changes of processes. And management only serves a purpose when it is acting to add energy to the system – when that stops, then the law of Business Entropy will kick in and the organisation will begin to decay over time. This management energy applies forces that disrupt the chaotic state and create dynamic new motion (innovation), gain momentum (business change) or maintain the bonds between particles (organisational structure and process). If the right forces are applied at the right time and in the right way, then the business can be moved to a new desired state. Of course if too much energy is added, then the system may become unstable and can either collapse or explode. Too little, and the natural inertia within the organisation cannot be overcome. (e.g. RonJohnson’s failed leadership and change of direction for J.C. Penney, while time will tell whether Kodakcan survive its endemic complacency and too-cautious response to digital imaging). What is the state of Business Entropy in your organisation? Are you moving with momentum, with management applying the right forces and energy to achieve the desired state? Or are you in a Brownian Business? And more to the point, what are you going to do about it? !